For 30 years, Cymbeline has been one of France's premier wedding gown designers. I thought I'd include one of my favorite dresses for a little late night inspiration. Enjoy! 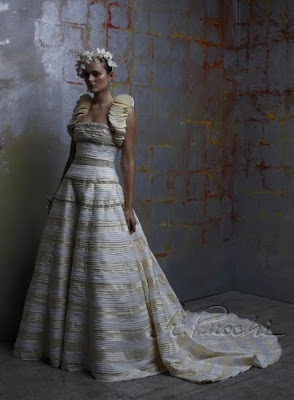 Isn't this a dreamy dress? Love the blog. I could use more tips and tricks, though. One quick question: If you had to give a bride one piece of advice on planning what would it be? "Seek out inspiration everywhere. From all aspects of life. You never know what will move you." "When you settle on a budget, stick to it. A couple hundred dollars worth of wiggle room is okay, but you should try to identify the aspects of your wedding you think are the most important and make those your splurge items. Try to pull the reins in on everything else." Happy Monday, y'all. I just wanted to put you wise to a new (to me) blog on the radar. The fabulous Lemiga Events. I'm seriously LOVING this Atlanta-based design genius. So, as you know, I am constantly on the hunt for inspiration. Today I found it in spades. Check out this incredibly designed wedding in a turn of the century warehouse! I die! Click here for the fantastic-ness! For this gem of the south, I say brava! I am working on several things this summer, not least of which is cultivating ideas for a great big country themed party I'm hoping to design. I have been considering some unique lighting schemes that are fabulously, uniquely country and have found some great inspiration! 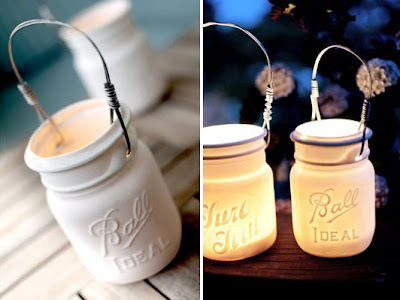 I can't wait to get going on the inspiration board...I am after all, a country girl at heart you know. I thought I would share some of my finds with you. 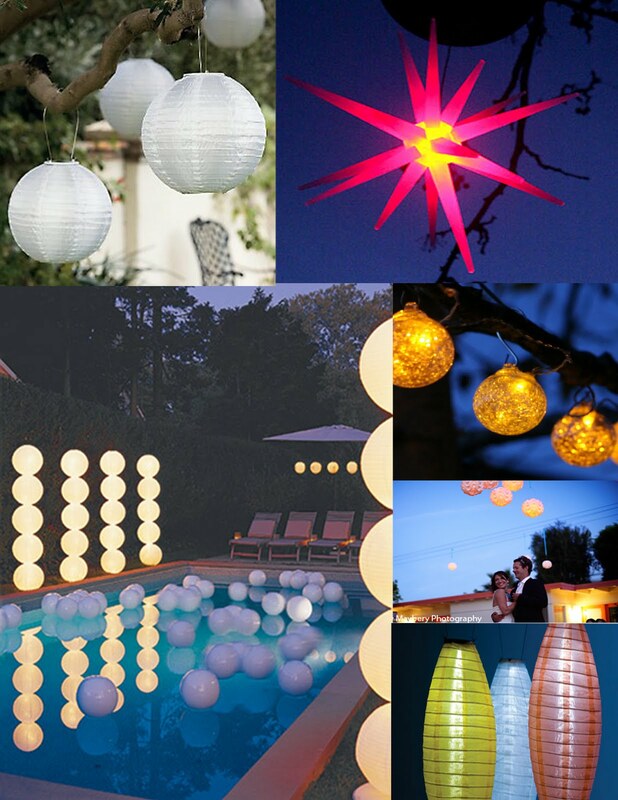 Consider some of these for your upcoming outdoor soirees. This picture is one of my favorites. Made from upcycled mason jars, these sweet hanging lanterns cast a lovely warm glow over an entire event. I love this look. If I was to take hold of this, I'd probably pair it with a few more clean lines while perhaps doing a wildflower centerpiece...so many choices. Here we have a variation on a really fantastic theme. These beautiful votives are porcelain! They've been cast in molds made from Bell jars. Lovely! We have mastermind Alyssa Ettinger to thank for these. Luminaries. 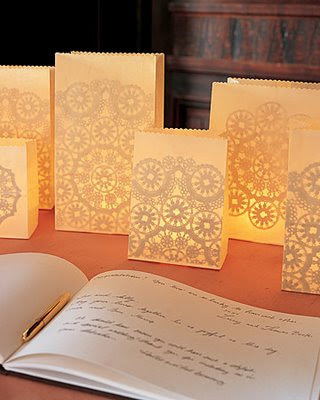 Beautiful, ethereal luminaries. I love to use these to illuminate walkways and driveways. They're beautiful on tables, hanging in trees, you name it! Well, I hope that was enough to get you started! We've got some of the most beautiful days of summer coming now, and I hope you all can use them to host some amazing outdoor soirees...I know I will! I came across this 2009 gem from St Pucchi. There isn't much to say, except...Oh. My. Blog. Can you believe the beauty?! I almost gagged on the genius. Enjoy! May Coco Chanel have mercy on our souls. St. Pucchi is one of my favorite couture designers in the history of ever and this is why. I die! Well! I don't know about you, but I've been having a ridiculously busy summer. I have been a fairly naughty blogger, ignoring all of you and everything...but fear not! I am back with a vengeance and will attempt to keep you riveted with all of the great things I've been working on. 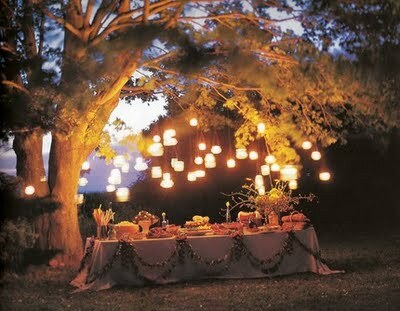 I am working on a few outdoor reception ideas and I've been trying to think up some really interesting lighting schemes. Seek and you shall find, indeed! I've included some ideas below. I've really been inspired by solar lanterns. Lucky for me they are everywhere lately. These are examples of some of my favorites. Brides, if you are having an outdoor reception or cocktail party, don't underestimate the power of lighting. Solar lanterns give you so many unique lanterns and are perfect for creating several different effects. They are usually well priced and available in large quantities. Brainstorm with some of your 'maids and you will be able to come up with fantastic and creative arrangements. For those of you constantly on the look-out for incredible party inspiration, have I got the blog for you! Party planning icon, Amy Atlas (swoon!) has a new blog! Two words for you. I. Die. It is possibly the most wonderfully inspiring blog in ever. But, you don't have to take my word for it...see for yourself! Amy Atlas's super awesome, totally wonderful blog.